A bike lane in downtown D.C. The District’s top transportation and public works officials are asking three of the biggest mail carriers in the country to ensure that their delivery trucks do not obstruct bike lanes after an apparent uptick in such incidents reported by residents and parking-enforcement workers. The request is part of D.C.’s Vision Zero plan to eradicate traffic fatalities by 2024. Last week, Jeff Marootian and Christopher Shorter, the directors of the District Department of Transportation and the Department of Public Works, respectively, wrote to the executives of the United States Postal Service (USPS), FedEx, and the United Parcel Service of America (UPS) about “constant reports” of the carriers’ drivers blocking dedicated bike lanes. In brief letters, the agency directors called the behavior “dangerous” and warned of traffic citations. “Although the District government is routinely alerted to such practices by [carriers] from our residents via social media and based on our conversations with bicyclists and parking enforcement officers,” Marootian and Shorter said, “it seems this problem has reached an alarming and widespread scale.” Citing the August death of a cyclist in New York who was fatally struck by a garbage truck driver after a cab driver had entered a bike lane—forcing the cyclist to swerve into traffic—the directors said that obstructing bike lanes could turn deadly. “We do not want to see a repeat of such incidents in the District,” explained Marootian and Shorter, adding that they welcomed discussions with the carriers. Curbed DC has reached out for comment to USPS, FedEx, and UPS, and will update this article should they provide any. The Department of Public Works announced the letters on Twitter last Friday. Reaction was mixed. 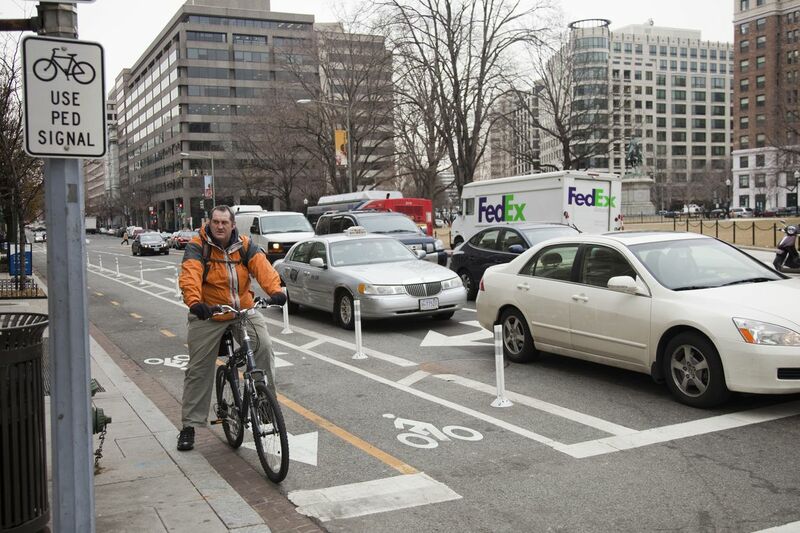 Many commenters said they supported the goal of keeping D.C.’s bike lanes clear of cars, but some questioned whether writing a letter was the most effective way to achieve it. Others said the District should more aggressively tow cars whose drivers park in bike lanes, including taxis and ride-hailing vehicles such as those popularly available via Uber and Lyft. Tickets don’t matter. Tow. Once packages are late they will change their delivery methods – find legal parking, or at the very least stop parking in bike lanes. Towing works too. There are already signs for drivers denoting where bike lanes are and that they’re for, well, bikes. Mayor Muriel Bowser’s administration is considering various actions to implement Vision Zero after a spike in traffic deaths over the past few years. One soon-to-début strategy is all-day pick-up and drop-off zones for ride-hailing cars in busy areas of the city. Another, which officials said they would roll out last week, is retiming traffic signals to give pedestrians and cyclists more time to cross the street. In D.C., 31 people have died in traffic crashes in 2018. Goodman, Realtors® is a Metropolitan, DC Real Estate brokerage that serves clients in Maryland, Washington DC, and Northern Virginia. We, at Goodman, Realtors®, pride ourselves on our unmatched customer service and our drive to exceed our client’s every home buying/selling expectation. We strive to make sure our clients have the necessary guidance and support to make all of their real estate decisions. For Everything Real Estate, GET GOODMAN!